The S.S. Meteor Preservation and Stabilization Project is coming up fast. The date is April 26 & 27, 2014. If you are receiving this email, your have either been on the project in the past or have indicated verbally that you were interested in joining us for the project. To learn more about the project and find out how you can help us with this very worthy cause, please click on the provided link below. We complete many tasks and have much fun doing it. You will meet new friends and most of all, it will be very rewarding that you have made a difference in the world in helping preserve maritime history. 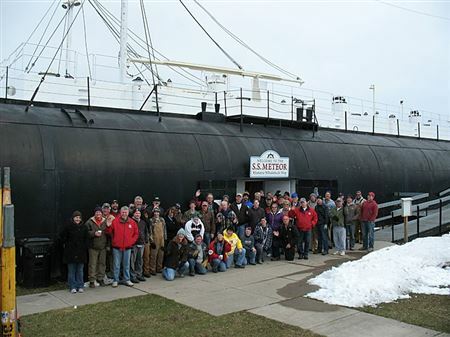 The S.S. Meteor Whale-back Museum Ship looks more than thirty years younger than it used to just from all the volunteer efforts many of you provided for the past eight years. Thank you to all that helped to make it possible to look so great! If you are truly interested in joining us, we encourage you to register for the project on this website. This is so we can create a roster and head count for the food. (We do not sell or give away any of your contact information). Here is the link to the Event page on the GLSPS website for you to register for the project. Lodging is available at Barkers Island Hotel / Inn. They are giving us a special pricing of $50.00 per room night for those participating in the Meteor Project. Their phone number is, 715-392-7152 715-392-7152. Ask for "Whale back Room Special". This year not only do we have our large list of tasks to complete we also have another project coming up on the horizon. The black part of the hull has not been painted for very long time. If fact nobody knows when the last time it was painted. This is going to take many gallons of special paint. Superior Public Museums is conducting a special program to encourage folks to Buy and Sponsor a Gallon Bucket of Paint to help restore and preserve the hull of the world’s last Whaleback ship. The cost of sponsoring a bucket of paint is $50.00 per bucket. The bucket of paint will be displayed in the tower of "Thanks" in the S.S. Meteor Museum with your name on it throughout the 2014 Touring season. This will provide notoriety for the folks that helped with purchasing the paint and ultimately the new look of the painted hull. Personally I have purchased two buckets of paint so far. I’m in a contest with another guy to see who will purchase the most buckets of paint! I encourage and challenge you to do the same. The GLSPS, other organizations and friends of the S.S. Meteor will be doing the dirty deed of applying the paint. Although, you can paint your own bucket of paint on the hull if you prefer only when we finally obtain enough paint to start and finish it within a few days. So, that being said, please purchase a bucket of paint. We certainly hope to have enough paint by summer when it is a much better time to apply the paint and for it to dry properly. A few of you have purchased a bucket of paint already. The folks that have not purchased a bucket of paint yet and would like to you can contact either one of us. (Sara Blanck of the SPM or Phil Kerber from the GLSPS). Contact information is below. We will be happy to take your verbal commitment however, we ask that you pay for it at the project when you arrive. If you cannot participate in the project and would still like to sponsor a bucket of paint, we can take cash, checks or credit cards. Special handling may be required for mail in checks. Thank you very much for volunteering in the past and hope you will join us again this year for the S.S. Meteor Preservation Project. We hope to see new and familiar faces again this year. The SS Meteor Preservation Project was another success. This year we had over 70 volunteers help on the project. The great thing is most of the much needed tasks were complete by the end of Saturday. However, most of the larger tasks needed to be finished the next day. The painting also needed more work especially in the engine room. Touch up painting was completed on Saturday. . The not so good news is that Sunday the weather went south on us and all outside tasks were moved inside except for the welding on the walkways and the life boat cradles were finished. Although tey still need to have several coats of paint. Maybe someone could paint the cradles this summer? Many tasks needed to be completed this year (Please see list below). Most of Sunday's tasks were completed inside the ship. Many more tasks were added as we went along and discovered more. Most of the new tasks were completed by the end of the day on Sunday. The completed tasks below are indicated by an Star / astric. You can also see photos taken by Dave Olsen, a professional photographer which also joined us on the project, and mostly worked with the Life Boat Cradles team. Please click on this link to see the photos. Please Note: More photos will be added as the come in and are uploaded to the website. Thank you so much for all that joined us and helped preserve the historical S.S. Meteor for many years into the future. .All of you have made a huge difference in preserving maritime history! *Touch up paint in Crew’s quarters, galley and mess halls. *Please Note:some areas may only need steel wool and wax to clean very small areas of rust.Mainly around bolt and screw holes. *Apply another coat of white paint to, upper engine room ceiling, middle level of engine room port side forward, and another other touchup areas in entire engine room. *Apply another coat of white paint to areas that still need it in lower engine room. *Clean and apply preservative on wrenches in lower engine room (clean with wire brushes wipe down and then apply the preservative. (Wrenches brought up from engine room to the black smiths for preservation treatments). After wrenches dry, place them in the tools rack on both sides of the lower engine room. Start painting floor of lower engine room. (Will need to be done after all other painting on the walls and wrenches are completed.Then wire wheel and wipe down the floors to prepare for painting with tile red color. Paint Valve knob red on heater / radiator of the chart room. *Paint up pipes, water tanks and other equipment on aft upper deck (White)?(Cream)? Most were painted but still have more to complete). *Scrape, clean and Paint the section already painted blue in the Aft Cargo hold (the one on the tour near engine boiler room with ladder leading up to the pump room. (Primer was painted on all of them and most have had the first coat of paint applied). Clean, scrape, seal with silicone and paint upper engine room walk way on starboard side (using a coat of rust inhibitor paint). Paint forward deck-anti slip sand in paint. *Wire low voltage system with button from the compressor for the whistle to the pilot house. (The whistle blows nicely now)!! *Replace missing light bulb guards (red) clean, paint and install when found. (Some have been found and painted). (More need to be found painted and installed back on light figures). *Remove / lift life boats to replace rebuild cradles that are under them both. (Dale Kosiol, Tom Brueshaber, Dave Olsen and Ken Knutson completed the port side life boat cradles only). Clean brass fittings in lower engine room including brass fitting from paint. *Check and repair small air leak in piping by compressor?? (No leaks at this time)! *Clean old silicone sealer, clean, apply new silicone sealer and paint band around lower part of the smoke stack. Main door threshold – fill in with sand, seal crack to keep water out and possible raise area to prevent tripping.Mark area with brighter yellow paint?? *Remove shingles from one display first, clean and prepare roof for painting-Paint grey. The above tasks were completed and the old girl looks much younger than when we started at the beginning of the project on Saturday. The GLSPS and SPM will be having another project painting the hull and other needed painting tasks this summer. We were thinking sometime in June when the weather is more favorable to paint. If interested in joining us, please drop us an email to let us know you are interested in joining us for another stepping stone in preserving the S.S. Meteor.. Thank you again to all of the volunteers that helped us preserve maritime history. The main S.S. Meteor Preservation and Stabilization Project is now past. The date was April 26 & 27, 2014. If you are interested in this project, we still have many tasks to complete. We typically only work on it one weekend per year however, the colder weather kept us off most of the outside work that needed to be completed for this year. The GLSPS and SPM is having another event this summer. Mainly for painting the Hull and other unfinished painting throughout the ship. The date is listed above. You will NOT need to register for this event. Please contact Phil Kerber - GLSPS or Sara Blanck SPM. We completed many inside tasks and had much fun doing it. You will meet new friends and most of all, it will be very rewarding that you have made a difference in the world in helping preserve maritime history. The S.S. Meteor Whale-back Museum Ship looks more than thirty years younger than it used to just from all the volunteer efforts many of you provided for the past nine years. Thank you to all that helped to make it possible to look so great! Thank you very much for volunteering in the past and hope you will join us again this year for the Summer S.S. Meteor Preservation Painting Project. The Hull Painting Project was long, hard and HOT! The weather this year was very hot for the area and quite likely record breaking. Despite the hot weather, we were still able to complete the hull painting. It took us two weekends but it felt good to get it done. We started off by cleaning the entire hull with pressure washers. Then we performed the necessary preparation by sanding and wire wheeling the areas that were rusty and needed special care before painting. We then added primer paint to needed areas of the hull. Finally, we were able to apply the first coat of black paint to the port side. We completed the entire port side and a small section of the starboard side until running out of time that weekend. We all decided we will need another weekend to complete the same process on the starboard side less the preparation done the weekend before. Those that could join us, came back the net weekend. A few new volunteers joined us as well. We completed the entire hull in two weekends except for the white letter of the name "Meteor" and the hull numbers. We will continue that task at a later date. _the white "Meteor" Name and numbers on the port side were completed the first weekend in October by Tim Pranke and Phil Kerber. Now the famous Whale Back Museum shines like a NEW ship! This makes all of us involved with the project very happy to see, even the staff of the Superior Public Museums and the City of Superior WI. Please take a moment to look through our photo album to see the results of the hull painting. Many thanks to the volunteers for sticking to the task at hand even in the warm (I really mean hot) weather we had during the two weekends it took to complete the painting. The Director Sara Blanck and Staff at Superior Public Museums are truly grateful for volunteers like us to complete such a large task. The GLSPS sponsors this preservation Project every year. We almost always have it the last weekend in April. If you are interested in joining us for this very worthy historical preservation project, please let us know. We will be happy to add you to the list of volunteers. The most amazing thing about this year's S.S. Meteor Project is that we counted more than 90 people volunteering for the project. Thank you again for your help. We really do appreciate all of you volunteering to help preserve maritime history!